My name is Audrey McGregor Williams and this is my beautiful five year old traditional cob Springtime Breche. I was fortunate to have had the opportunity to buy Breche when she was a three years old, through riding her mum, so I already knew that she was the type of horse for me and that her temperament was the same as her mother’s, but as an older rider and first time horse owner with limited riding experience, I was already apprehensive and wanted to ensure that she had the best possible start regarding her education, so I brought her to be backed and schooled properly by Karen with the help of Abbie Pearson here at KA equestrian. This was a very positive experience for both Breche and myself, as I felt confident and assured that the process had been carried out in a professional and sympathetic manner with lots of opportunity to pop along and visit throughout her four weeks at Karen’s.On returning to the livery yard we were at, I then started to have a couple of lessons a week on her from a lovely lady who had experience with youngsters. I also had a very competent young rider schooling her once a week and all was going well. We returned to Karen’s the year later to have a lesson and run through a wee dressage test. I was feeling really pleased with our progress. Things started to change and Breche developed a resistance to even approach the mounting block never mind standing at it. This led to me falling off at the block and fracturing my coccyx which followed on to a huge anxiety issue for us both. On investigating further and taking more advice as to why Breche was resisting at just getting the saddle on now and didn’t want to be ridden became apparent, she had a sore back. We then followed on with what seemed like a very long process of saddle fittings and lunging. It was at this point a livery place became available at KA Equestrian and although we were very happy where we were, it seemed too good a chance to miss out on and I contacted Karen and we moved within a couple of weeks. Since coming to Karen’s we have had the lovely equine osteopath Emily Cuthill to look at her. Emily then advised that we should only lunge Breche for 6 weeks to build up her back muscle which we did. We then had another dentist visit along with another saddle and bit fitting. After the process of elimination was complete Breche was still unhappy at the mounting block and had now associated it with pain. At this stage my confidence was at it’s lowers ever and I radiated fear and worry which didn’t help the situation. I knew that I had to have help with this and it was now about me and my actions to overcome my thoughts. Team KA is a group of young riders based at KA equestrian and is generously sponsored by the lovely Jane Brindley from “Horse Riding With Confidence” and although I am no longer young lol …. I was encouraged by the work that Jane did with the group and wanted to be included, so after attending my first session with Jane, Karen and the rest of the fab young riders I found inspiration in the fact that we all had different goals and challenges of equal importance, where we needed to also look at our achievements and what we needed to work on. Feeling part of this has given me new focus and determination. I realised that what Jane was saying was exactly what I needed to do. I needed to look at exactly what my anxiety was about and where I wanted to be next year. Identifying my goals and talking about them openly with others really made a difference, and putting a time on this too, which I think has been the most helpful way of thinking for me. As a direct result of my session, I felt I was more aware of what my anxiety was around and challenged this at the mounting block with some invaluable initial support from Abbie, I have now managed to get on my beautiful pony without any issues. In only one month I have taken Breche to our first showing clinic and taking part in the riding sessions with Team KA.We have definitely made huge progress in only a few weeks with a decreased level of anxiety which had allowed me to now concentrate on improving my riding and enjoying my relationship with Breche. I will continue to meet with Team KA once a month and benefit from the team spirit and inspiration that comes with it. I also plan to have a weekly lesson with Karen when possible as this is also encouraging and motivating. We have another showing clinic booked with Brian Williams an Hilltops Equestrian at the end of March….I never expected to be moving on so quickly and I feel amazing! I am honoured to work with the members of Team KA helping them to develop a positive mindset, to make the most of their riding opportunities and to be focused as they set out on their competitive journeys. Each team member has their own strengths and challenges and some will be contributing blog posts throughout 2018. Here is a lovely post from Bethany and I am enormously grateful to her for her kind words about the work we do together. My name is Bethany, I’m a 14 year old equestrian who met Jane through Team KA, a team of young riders based at KA Equestrian of whom Jane is a sponsor. Jane has very kindly invited me to write a blog for her about my experiences with confidence and how her sports psychology sessions have benefitted my riding mindset. I’ve had my fair share of confidence knocks over the 7 years that I’ve been riding. My horse Tia was only 4 when we bought her, and as the owner of a young horse I’ve definitely learned a lot about ‘bouncing back’ from bad experiences. A good example of this is a fall I had not long before Christmas last year, in which Tia was spooked by horses in the field and bucked me off. This accident landed me in hospital for a day, which was a fairly scary experience. Finding the courage and confidence to get back on after a bad fall is never an easy thing to do. As humans, our natural instinct is to avoid danger, and when put in a situation we know to be potentially dangerous, we tend to try our best to avoid it. “Getting back on the horse” is a term used quite often in reference to other challenges in our society, but us equestrians take it literally. When faced with riding Tia again, I was admittedly pretty terrified. I kept replaying the fall in my head over and over until my memory of it morphed into something worse than what actually happened. Something that Jane talks about often is dramatising a bad experience. This can be through retelling the event, or even simply replaying it in our heads, as I did, and all of this can make the experience appear to us far worse than what it was in reality. However I found the best way to overcome these fears and doubts was, to put it simply, to get on with it. I found that the longer I waited to get back on board, the worse my mindset became. The first ride back will always be the most nerve-wracking, but once it’s over, the feeling is so elating. When I was younger, I was never a particularly confident or ‘gung-ho’ rider. Whilst all the other kids were keen to jump and gallop about, I was much more reserved with my riding. My first two ponies were both not quite right for me at the time, so by the time my third pony came along I had little confidence left. My third pony Andre was what is known in the equestrian world as a ‘confidence giver’. He was a been-there-done-that kind of pony, which was exactly what I needed. In the space of 2 and a half years, he took me from a nervous, tense rider to flying round cross country, jumping a metre and galloping through fields. I think that in some cases people can be ‘over-horsed’, and this was definitely the case for my first two ponies. It can take a few gos to find the perfect pony or horse to suit you, and you won’t gel or bond with every single horse you meet/ride. But that makes finding your dream horse that much more amazing! I hope that you all enjoyed this little blog I put together, if you enjoyed me in general and would like to see more of me and my journey with Tia then you can follow my Instagram, @brp.equestrian! Another huge thanks to Jane for letting me write this blog post for her! Her sessions have been incredibly beneficial to me and I hope to continue to have the privilege of her services throughout 2018. Yesterday evening I was recording a short video piece with a friend which gives a couple of tips for Winter motivation so I thought I would write about this subject today in a little bit more detail. In my opinion we have a choice about how we view the season of Winter. We can either spend the next few months moaning about it being too dark, too cold, too wet, too muddy or we can embrace this time of year and think of it as an opportunity. So here are my tips for some Winter Motivation. 1. Accept that we live in Scotland (or elsewhere in the UK/Europe/Northern hemisphere) where the Winter days are short and, let’s face it, it rains a lot! There is nothing we can do to change that. So, as always have a think about what you are saying to yourself eg ‘This is awful’, ‘The weather is ****’! If you’re constantly telling yourself that something is awful then that is what you believe. 2. Have a look at your goals. How did you get on during the Summer months? Is there anything that you need to work on? Once again, look at it as an OPPORTUNITY. 3. Are there any situations which you are avoiding eg riding on windy days or avoiding those shadowy corners in the arena? Yet another OPPORTUNITY to do some de-sensitisation work. 4. No where safe to ride? Guess what? Another OPPORTUNITY! Group together with some friends and hire an indoor arena. Make plans to ride out with other people. (You’re much more likely to do it if it’s in the diary). 5. Be nice to yourself. Use plenty of moisturiser and lip balm. 6. Missing the shows and events? You’ve got it! Another OPPORTUNITY! Investigate Winter leagues and arena events. Sign up and make a commitment. Check back on your goals and measure your progress. 7. Work on your fitness. Use the OPPORTUNITY to sign up for a pilates class. Go for brisk walks with the dog. Set yourself up for the Spring. If the weather is too bad to ride spend time with your horse instead. Give him a good groom and thorough check over. Adjust his feeding as necessary. Give your tack a deep clean. 9. And if you really can’t ride…..
Don’t feel guilty, your horse won’t mind having time off. Enjoy the extra time with family or non-horsey friends. Read a book by the fire. So, I hope you enjoy the Winter Season and do let me know how you intend to make the most of the opportunities which come your way. This week I feel as though a lot of hard work has come to fruition and I feel like celebrating that fact. I’ve posted on Facebook about the things I’ve been doing with Horse Riding with Confidence Scotland this week but I think they are worth repeating for two reasons. Firstly, to remind all of you who read this that hard work does have benefits and secondly, to remind myself that I can be proud of the good work I have done. There have been the usual 1:1 clients, I can’t talk about them specifically due to the importance of confidentiality but those people I am seeing at the moment are making good progress and I am happy about that. Something new for me this week was presenting a talk to the new intake of Equine Studies students at Oatridge, Scotland’s premier Rural College. This was a challenge as I normally talk to small groups in a fairly relaxed and casual setting whereas in the college the group was about 70 students and therefore, by necessity, a bit more formal. However, I felt that it went well and I certainly enjoyed the afternoon. As I write this I’m waiting to hear the feedback but those who spoke to me at the end of the talk were positive and I am happy with that. The talk came about because one of the lecturers on the equine studies course attended a talk I’d given earlier in the year as a fund raiser for an old friend who was doing the Wobbleberry Challenge, she liked what she heard and felt that the students could benefit from the ideas I had spoken about. Later on Wednesday I headed over to Lindores to talk to the riders attending the Equiteam Confidence Camp. I am a regular contributor at these camps and love going there and joining the riders for an evening. This time there were quite a few familiar faces and I was really delighted when some of them said things which showed me that they had remembered, and found useful, things which I had said at previous camps. This time we had a bit of fun and did some role playing. Everyone joined in, and as well as riding skills the campers showed great potential in the acting profession! The following evening I returned to camp to join them for a demo by Catriona Goulding animal Physiotherapist. We painted three very patient horses to show the skeleton and major muscle groups and then listened to Catriona talking about how different ways of going and different types of riders affect the horse physically – fascinating stuff. It was fun being at camp in ‘off-duty’ mode and having the opportunity to chat with everyone again. Tomorow I am attending the KA Equestrian open day to give a presentation on the use of visualisation as a tool to help riders to achieve their goals. I work regularly with KA Equestrian doing a monthly blog for them and sponsoring the Team KA by giving them coaching on the mental preparation for competing. So, where was the hard work you might ask? It all sounds like a lot of fun when I read back through what I have written! The hard work has come through many years of training and experience working with horse riders who for many reasons struggle with confidence issues. This has involved continued study and professional development which have allowed me to research and develop the information I share with clients either on a 1:1 basis or at a talk or workshop. The hard work has also involved pushing myself out of the comfort zone of working 1:1 and moving into a far more public arena of standing up infront of groups of people and hopefully educating them in how they can overcome the anxiety or fears which hold them back from achieving their riding goals. If you have read this then I do hope that it may remind you that hard work really does pay off and I would love to hear from you about your own experiences which also prove this. So, for me it has been a very good week and, what is even better, there are a lot more good things in the diary for the Autumn months. Well, here we are at the end of August, there is definitely an Autumnal feel in the air, leaves are beginning to turn colour and berries are ripening. I am wondering how your Summer has been? What have you done wth your horses? Have you been out and about competing or have you been making the most of the light evenings and enjoying hacking out? I have been thinking (again) about how we can all learn from any mistakes we make and how we can use these as a learning opportunity. We will all make mistakes and it is so important not to beat ourselves up over these but rather to use them as an opportunity to do things differently next time. After all, if we keep repeating the same mistakes over and over again then we aren’t learning and therefore we shouldn’t be surprised if we don’t make progress towards achieving our goals. My Summer, here at Horse Riding with Scotland, has been busy and productive. I have been making the most of networking opportunities and looking into different ways of marketing my business so that I can reach more riders with the messages I have about how to ride more confidently and therefore to enjoy riding more. In the past I frequently had a lull in the Summer months but that hasn’t happened this year. Instead, I’ve had some talks to do and ongoing 1:1 clients to see and there are some exciting prospects ahead for the Autums months. One of the most exciting things coming up is that I have been asked to speak to the new intake of students on the equine studies courses at Oatridge College. Something new for me, in that, my talks are generally pretty informal but this one will involve a group of about 90 students in the college setting so I am looking forward to the challenge. One of the fun things which I did over the summer was to have a photo competition to win a 1:1 session. The prize went to the photo which best represented ‘Confident Riding’. a few of the pictures were taken through the horse’s ears and I will use these as blog photos for this and future blog posts. 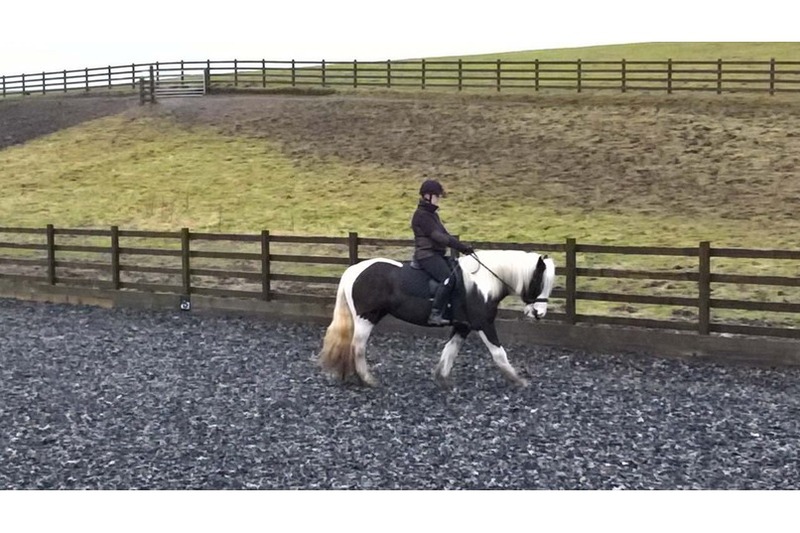 Today’s pic is Chloe riding Jack on their first solo hack after losing her confidence – very well done to Chloe. Just a quick post this morning to tell you about a purchase I have just made – a nice new notebook for jotting down my thoughts and goals! Not very exiting? Well, if you are anything like me then you love to have a nice notebook and find a blank page to be a great motivation! From school days I have always loved jotters and notebooks, and all stationery really and I haven’t yet moved over to making notes of any significance on my phone or laptop. I have a lot of plans and goals for summer 2017 both personally and for Horse riding with Confidence Scotland and my new notebook will help me to keep a track of them and to make sure that I follow them through and track my progress. As I said there is lots happening with a talk at the Wobbleberry Camp at Lindores next week, a full diary of clients to see 1:1, ongoing work with Team KA and an exciting trip to Peebles to talk to Peebles and Tweeddale PC camp in early July so I need to make sure that i keep a track of everything and if you keep an eye on the Facebook page then you will see how things are going. What are you planning over the next couple of months? I’d love to hear about your goals and achievements.